Acid reflux occurs when the stomach cannot withstand the pressure of its contents which are then forced backward through the lower esophageal sphincter into the esophagus. The corrosive contents of the stomach irritate the sensitive esophageal lining leading to heartburn and other complications. Since eating habits form a major cause of this condition, it is but obvious that healthy eating habits can fix this problem. But other remedies may also aid the acid reflux healing process. · Garlic keeps the gut flora at an optimum level and has antibacterial and antifungal properties. Fresh garlic works best but it must be chewed or crushed before swallowing to allow the allicin, the active ingredient, to be effective. · Ginger aids digestion and is effective in reducing acid. · Chewing on liquorice root is believed to be a natural cure for heartburn. · Caraway seeds made into tea or chewed help relieve symptoms of heartburn quite effectively. · Apple cider vinegar taken as a solution diluted with water or as capsules can also have a healing effect. · Keeping a diary of foods eaten and the symptoms. It helps in avoiding foods that trigger attacks. · Reduce weight if overweight as the extra weight tends to put pressure on the stomach causing regurgitation. Physical exercise will not only help in weight reduction but also improve emotional well-being. · Regularize your eating and sleeping habits. · Although you can get temporary relief from some over-the-counter heartburn medication, you can actually damage your digestive lining if you take too much of those for too long. 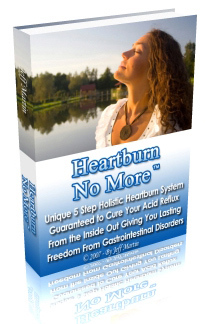 All these remedies will help only in reducing the symptoms but not in eliminating the causes of the acid reflux. The holistic approach is essential in the treatment of GERD. It treats the body as a whole, eliminates all the causal factors of acid reflux, and is in perfect alignment with the natural functioning of the body. It is also completely safe as it is not associated with any of the side effects of conventional medicine. As the body becomes healthy it will gradually heal itself and symptoms will disappear.